You probably wouldn’t use wine glasses at a casual business luncheon; nor would you hand out plastic stadium cups at a fancy corporate dinner. 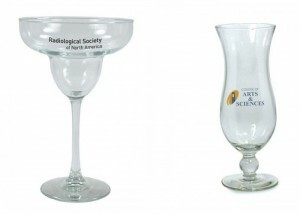 Branded drinking glasses are wildly versatile – they can serve as both event decor and promotional products. But it’s vital to use the correct type of glass for each scenario. With the many different kinds of drinking glasses available, choosing the best type for your situation can be a little overwhelming. Here a bit of background on different types of drinkware, and some pointers for incorporating them into your marketing plan. These types of glasses are intended for use at corporate occasions, be it a public function or an internal event among colleagues. When planning an event, environment is everything. Different glasses will have a different effect on your event’s atmosphere and your guests’ perception. 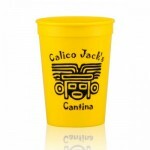 It’s important to choose custom drinkware that meets your needs and meshes well with your event’s overall theme. Originally conceived as a more sanitary alternative to shared glasses at public faucets, these one-time-use custom cups can be made of paper, plastic or Styrofoam. By its very nature, disposable drinkware tends to be a less eco-friendly option than reusable glasses, but there are plenty of relatively green options. Greenware cups, for example, are made of entirely biodegradable plastic, and will break down completely in a matter of months. The drawback to disposable glasses is that they’re really only effective as a marketing tool until the event is over and they get thrown away. They do, however, tend to be less expensive, so they’re often easier to buy in bulk. This makes them ideal for serving beverages at marketing events where you expect a huge number of people to come and go, such as a trade show booth. Like the name suggests, plastic stadium cups are quite popular at public sporting events. They’re reusable, sturdy and durable, making them very appropriate for outdoor occasions. They’re also the obvious alternative to disposable glasses for business events that are still somewhat casual, such as picnics and barbecues. They often double as promotional products; potential customers are likely to take them home, and their low cost makes them especially well-suited for functions with a high turnout. Beer is often stereotyped as a, shall we say, “uncomplicated” beverage – but it’s a surprisingly common offering at many sophisticated events. It’s also a very diverse beverage with a similarly varied array of beer glasses. High-quality ales and stouts are best served in stemmed glasses, allowing connoisseurs to swirl and enjoy the aroma. Pilsner glasses, on the other hand, are typically tall and wide-mouthed to show off the beer’s color and create room for the foamy head; naturally, they’re usually used to serve pilsner but can be filled with nearly any light beer. Be sure to use beer glasses that complement whatever brew you’re serving. 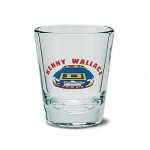 Many people collect beer glasses, so they may also double as a promotional favor that guests can take home. Though the word stein hails from Germany, it doesn’t literally translate to the iconic beer mug we know here in the States. It actually means “stone,” which is what these drinkware items are traditionally made from. They can, however, be made from many different materials, including plastic or glass. 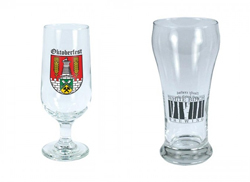 The beer steins you choose will depend greatly on the tone of your event. If you’re planning a polished, businesslike banquet, you’ll likely want to stick to glassware. If it’s a more casual and easygoing affair, consider using plastic steins to save on expense. Just like with beer, different kinds of wine work best with different types of wine glasses. Champagne is best served in thin flutes that hold in the bubbles. Red wines are preferable in wide tulip-shaped glasses that give them more exposure to the air, while most white wine glasses are smaller and of varying widths depending on the specific type of wine. They can be either glass or plastic, depending on your budget and the logistics of your event. Wine is the refreshment of choice for many banquets, fundraisers and (obviously) wine tastings. If you’re not serving alcohol, there’s still no shame in adding a little sophistication to a promotional event. Wine glasses or champagne flutes can be a mature and professional touch even if you’re only serving soft drinks. 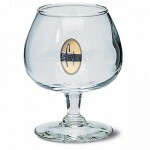 Snifters have almost a teardrop shape, with a wide bottom and relatively narrow top. These are optimal for aged spirits such as brandy or whiskey because the short stem allows people to easily hold them from underneath, so that the heat from their hand warms the liquid inside. This type of glass was especially popular in the 1940s and 50s, when it was heavily featured in Hollywood movies as a symbol of high society and expensive taste. Typically, this style of glass works best for more intimate gatherings, such as a meeting between close-knit colleagues or business partners. 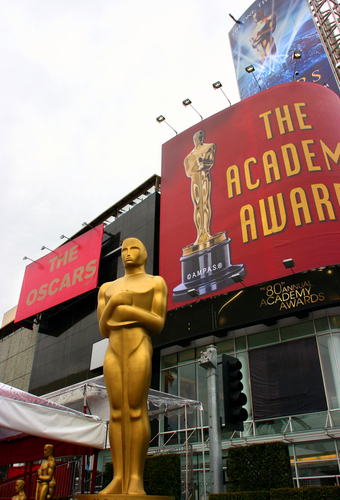 Depending on your desired atmosphere, it might be used to mix in a hint of luxury, refinement or nostalgia to a promotional event. They’re not just for martinis anymore. 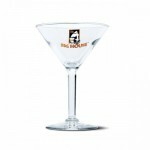 With the growing popularity of “appletinis” and other specialty cocktails, martini glasses work for a variety of unique business events. They can even be used to serve “shrimp cocktails” and other tasty appetizers. These glasses are often associated with 1960s aesthetics – the “cool” and effortless style of James Bond or Mad Men. The distinctive cone shape of cocktail glasses prevents the ingredients of the drink from separating from one another, and draws attention to the olive, umbrella, or any other “accessory” that might happen to be inside. Much like wine glasses, martini drinkware can be glass or plastic, and they can add an offbeat accent to an event even with non-alcoholic beverages. They’re best for situations where you want the atmosphere to ooze style, such as a product launch party or themed end-of-the-year celebration. When you’re serving certain specific drinks at an event, you’ll probably want to use the appropriate glass. Margaritas, for example, are often served at themed events with an ethnic flair. They’re typically served in wide, stemmed glasses similar to the champagne saucers used at many wedding receptions. Margarita glasses are rarely used to drink anything that isn’t a margarita, so generally you should only use them at events where you’re serving the appropriate beverage. Another example is the hurricane, a sweet, fruity drink popularized in New Orleans. The drink was created at a bar which still serves it in a signature logo glass – one of the most sought-after souvenirs in the French Quarter. 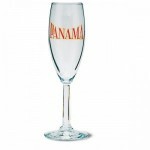 Hurricane glasses have a distinctive lamp-like shape that gives your event a bit of charm and style. History is a little unclear on the origin of the shot glass, but they’ve been used as marketing tools since the late 19th century. With the liquor industry’s fierce competition in pre-Prohibition America, it wasn’t at all unusual to receive free branded glasses from distilleries looking to elevate their business above the rest. Companies that specialize in beverages (such as breweries or soda manufacturers) sometimes offer free samples at public events in small taster glasses. These can be either disposable or reusable; reusable ones give recipients a persistent way to remember your company so they can easily seek out your business in the future. Tasters and shot glasses are a very common collectible item, making them particularly appealing as a promotional product. That doesn’t mean that you can’t also use them to serve drinks at an appropriate event, but consider allowing guests to take their glass home with them as a lasting reminder of your brand. Certain types of drinkware don’t lend themselves well to serving refreshments (it’s pretty rare to offer someone a travel thermos full of hot coffee, after all). They do, however, make great event favors, giveaway gifts, or leave-behinds at corporate gatherings. 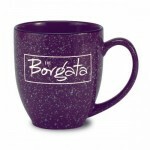 Elegantly simple and timeless, mugs have literally existed since the stone age, when they were fashioned out of clay. Today, they’re typically made from ceramic or acrylic materials. Coffee mugs are light and compact, but more than that, they’re useful. 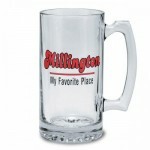 Personalized mugs make excellent business gifts or handouts at a corporate function. They’re practically the iconic “office” drinkware; everyone knows that one co-worker never seen without their favorite coffee mug. Even non-coffee drinkers often use them as pencil or paper clip holders. This makes them especially valuable as a promotional product; if a recipient makes use of one, your logo will likely receive exposure in that office for a long time. Travel mugs are a fairly recent invention. 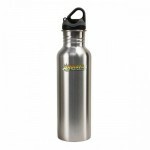 They’re usually made from stainless steel or acrylic and are built similarly to a thermos, with thick insulated walls and a sealable lid to prevent drinks from warming or cooling too quickly. 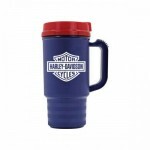 These types of mugs are highly mobility-friendly, whether you’re walking or driving. Recipients are more likely to use them when they’re traveling, so a personalized logo or message is bound to get more exposure to more people. 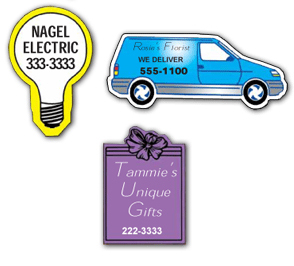 They’re perfect for handing out at conventions, conferences or trade shows. What we know as the thermos (the technical term is “vacuum flask”) was invented by a chemist in the late 1800s, and was originally used to store liquid gases for experimental purposes. Insulated thermoses use a near-vacuum to effectively prevent hot or cold drinks from changing temperature. People frequently take vacuum flasks to work or on outdoor excursions such as camping trips. Anyone who does a lot of traveling can make excellent use of a good promotional thermos, so they’re a good way to spread your message far and wide. Reusable water bottles come in a variety of styles and materials, from aluminum to color-changing plastic. These have seen a rise in use thanks to the recent increase in global environmental awareness; you can usually find people using them in gyms or at work. 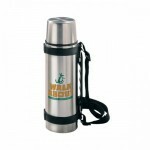 As such, promotional water bottles are a good idea at “active” events such as corporate retreats or outdoor festivals. If it’s a warm day, they’re likely to get plenty of use before they leave the event. Stick to reusable bottles rather than custom labeled disposable ones; recipients can take them home and further spread your message when they’re out and about. Technically, the term “tumbler” can apply to nearly any drinking glass with a flat bottom and no handle. The word has been used to describe everything from shot glasses to vacuum flasks. We at Printwand classify tumblers as a sort of hybrid between thermoses and water bottles. They’re sturdy and easy to travel with, but don’t necessarily keep drinks warm or cold the way a vacuum flask does. 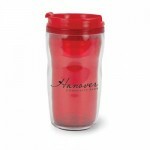 Tumblers come in a variety of colors and styles, so it’s relatively easy to find one that complements your promotional design. The right drinkware can give your business a major sip of success. Don’t be afraid to get creative with different types of drinking glasses for your promotion or event – just make sure that they fit in with both your message and your budget.